Bolivia is a landlocked country in South America stretching from the Amazon Basin to the Andean highlands known as the Altiplano. It is the poorest country in South America, with nearly half of the population living below the poverty line. This rises to 60% living in poverty in rural areas, where people depend on farming to make a living. The most disadvantaged people have the skills and knowledge to propose and implement strategies to change their lives and communicate their needs to decision-makers. 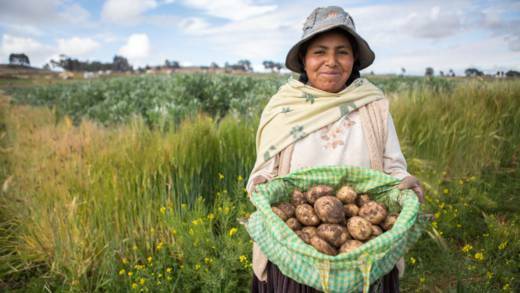 The poorest people in rural areas are able to produce nutritious food to sustain their families throughout the year. The impacts of climate change are understood and that communities are able to cope with these changes in climate. Human rights are understood and respected. Natural resources are managed in a fair and transparent manner. In 2016 we started a new Hands On project on the Altiplano. Over two years our partners are working with local communities, helping families to transform their land to farm more productively and have easier access to water for their crops. By getting Hands On you can help equip the families to deal with the harsh, extreme environment they live in, and thrive in it. We're seeing changes from year to year. The climate is changing. The rain used to arrive at the time it was due, but now it's delayed. There's not enough water to feed the pastureland when it doesn't rain, so the animals grow thin. When there is no water and no pasture, they die.